Rally Saber is a fast paced, competitive turn-based sword fighting sport. Using the 3 Foundational rules, you will be able to fight like swordsmen from the movies. 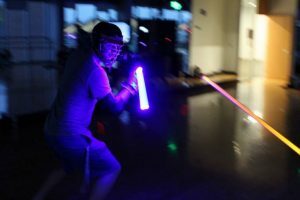 Rally Saber has been in development for years, with the goal to change the way competitive sword fighting works. This sport puts more focus on making defense drastically easier than traditional sword fighting sports or martial arts. The theory is that if you can see attacks being made more easily, you will be able to defend properly more often, which will result in longer, more cinematic fights. Using the quick start guide, you and a friend can engage in epic duels that feel substantial and memorable, with as much flair as you want. If you wish to pursue it on a professional level, you can join or start a team of your own and compete in a league. The three primary rules of the sport are implemented to create a heavy emphasis on defense. 1) Turn-based. This is the key feature to the sport that enables such controlled and clean fights. This feature is why we refer to the sport as “Rally Saber”–it refers to the continuous back and forth of attacker and defender. 2) Bring It Back, Then Attack. In order to make an attack, the attacker must bring their blade tip back behind them, before they make attack. This is called “breaking the plane”, and it’s another feature to allow the defender a better chance to repel an oncoming attack. 3) Direct Swings. When an attack is made, the attacker must make a direct, smooth, unwavering curve with their swing. No feinting, no swing speed change, and no wavering. This makes the attacking blade trajectory easier to prepare for, and defend against. Spinning during a fight is now a strategic move with these rules. The turn-based approach affords the attacker protection while they perform a spinning strike, as the defender is not allowed to attack during the defense phase. Wide flourishes are a natural part of this sport, as the players’ blades must essentially stay in fluid curves as they move back and forth in offense and defense. Rounds last substantially longer than all other sword fighting sports/martial arts, as this is a very defensive sport. This makes for a much more exciting fight for spectators. Satisfying cinematic sword fighting exchanges are beautiful and very regular in Rally Saber, whereas in other sword fighting sports/martial arts, they are less common. Pick up a sword, or even a stick, and give it try with a friend!